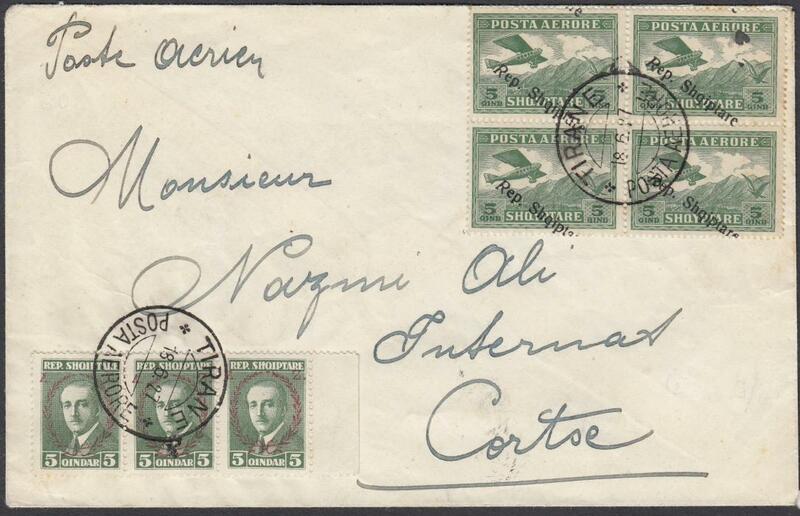 11943 registered censored cover to Switzerland, franked 3a. and 6a. 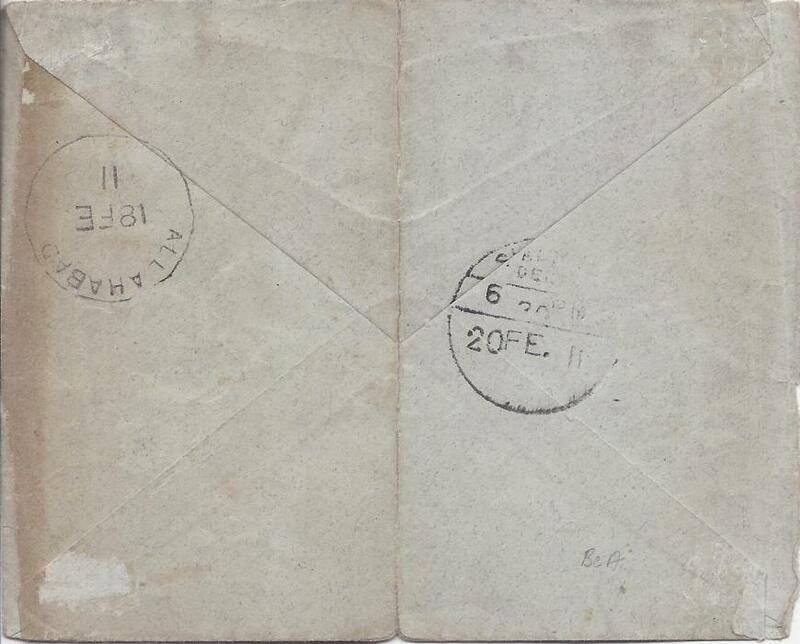 airmails tied Kuwait Persian Gulf cds, black Bombay and violet English censorship cachets on front, reverse with German censor tape and arrival cds. Ex. Kiddle. 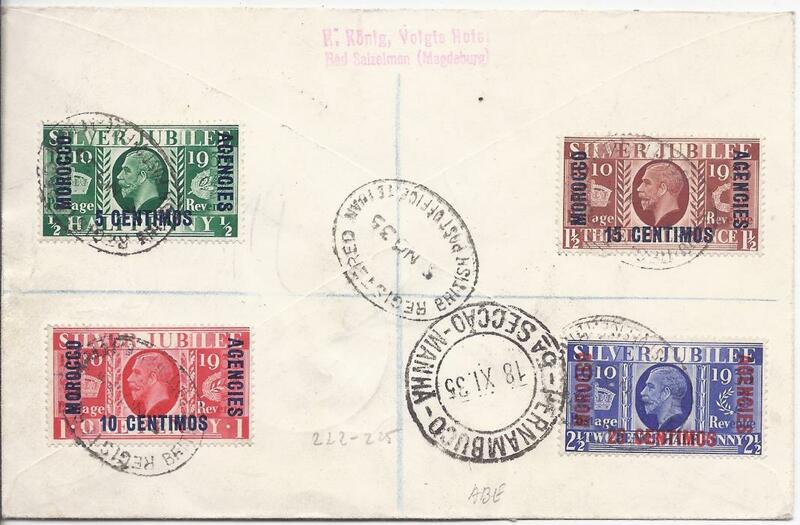 1924 registered airmail cover to Switzerland franked 1920 Rama VI issues 2s. (2), 5s. (4) and 15s. 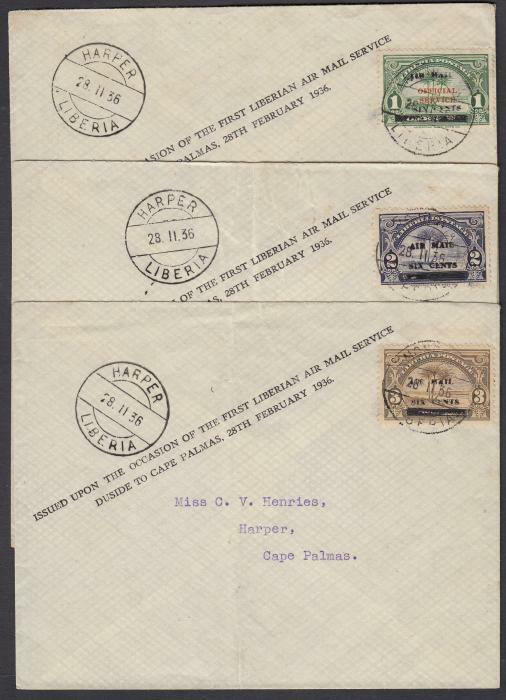 (3) all tied by three large 'aeroplane' illustrated Roi Etch date stamps, registration handstamp bottom left, reverse with Bangkok 2 and 5 transit cancels and Bern arrival cds. 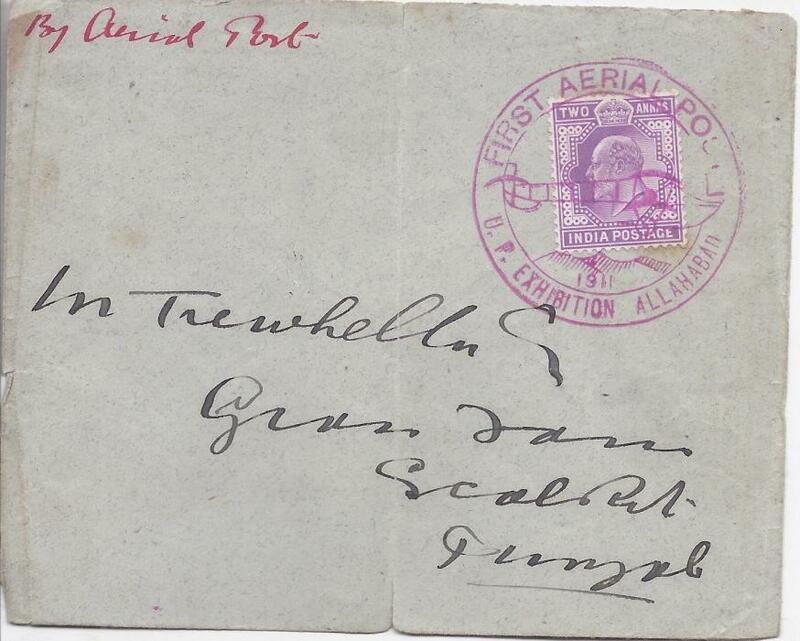 1927 Airmails 5q green block of 4 with shifted overprint (few teeth slightly toned) together with 5q green marginal strip of 3; attractive franking on airmail cover from 'TIRANE/18 6 27' to Italy with arrival mark on reverse. (Cat.144(4), 153(3)). 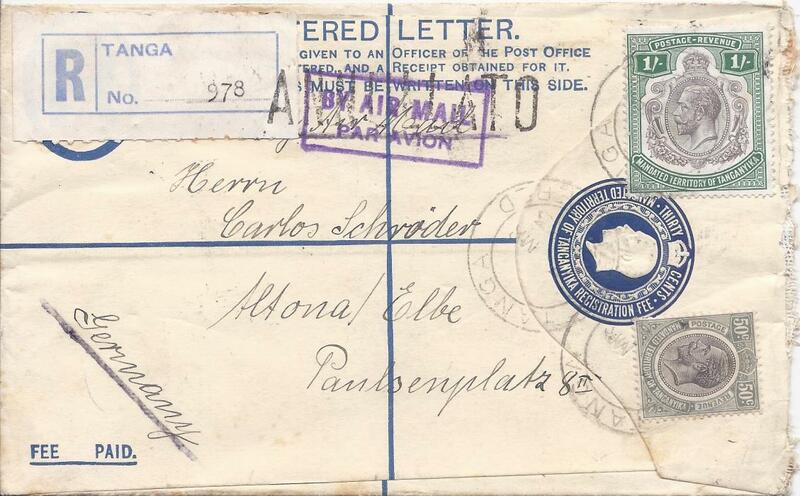 1929 registered air cover to LIMOGES, France, on First Postal Flight by Bailly & Reginensi. Franked strip of 3 x 6c., '6 cents' on 15c. + pair 40c. tied by SAIGON date stamp and commemorative flight cachet. 1929 Registered air envelope to HANOI franked '20 cents' on 50c. & '80 cents' on 2fr. tied by SAIGON date stamp. 1931 airmail cover Vavau to Pasadena, United States, franked front and back with airmail handstamp; generally good condition. 1931 Registered Express air mail envelope to Paris franked 6c., 10c. (3) & 50c. tied by HANOI-TONKIN date stamp. Annotatednto go by air 'SAIGON-MARSEILLE'. 1933 30c. 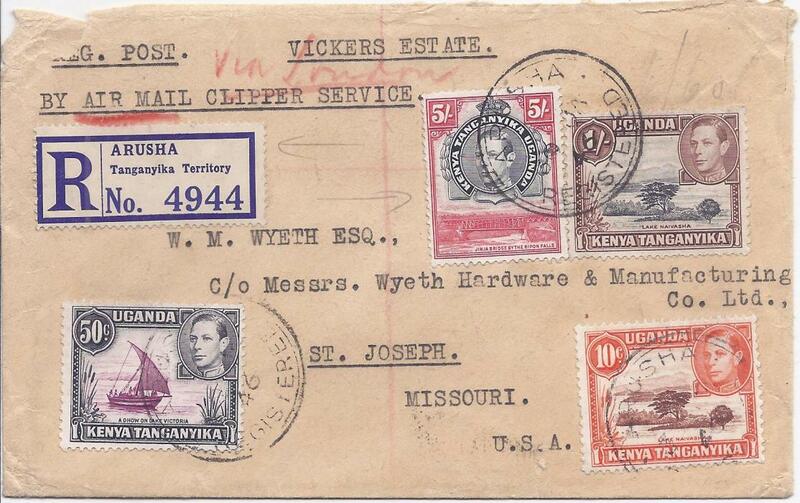 postal stationery registration envelope uprated 50c. 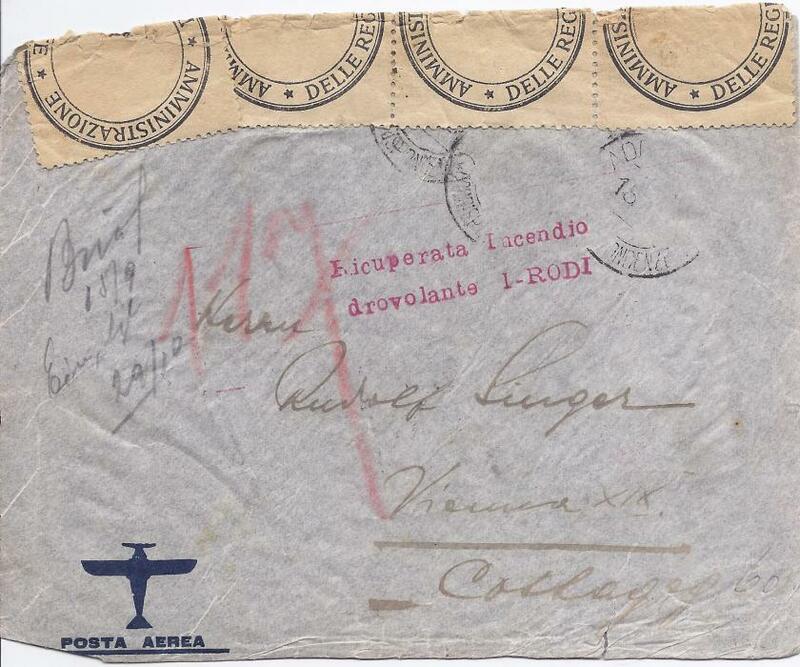 and 1/- and sent airmail to Germany from Tanga, airmail handstamp at top has been handstamped �ANNULATO� at Brindisi on transit, reverse with Moshi transit, Brindisi transit and Italian t.p.o. and Altona arrival cds. 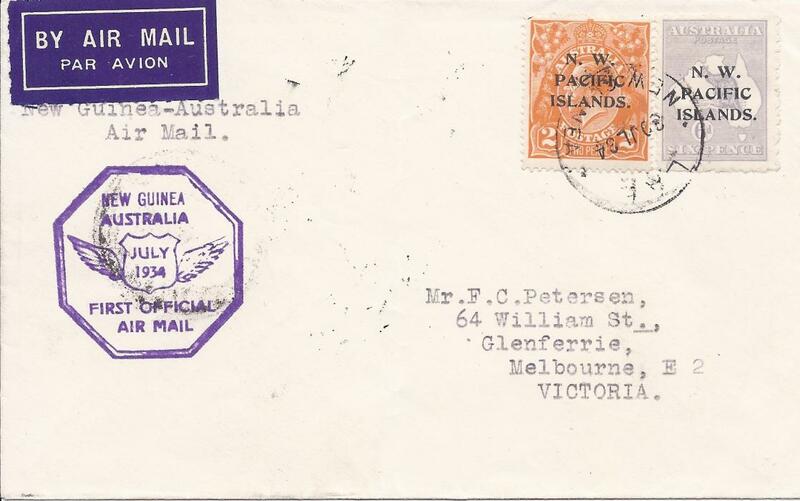 1934 (30 JL) airmail cover to Melbourne franked N.W. Pacific Islands overprinted 2d. and 6d. tied Lae cds, first flight cachet at left, arrival backstamp of 1 August. 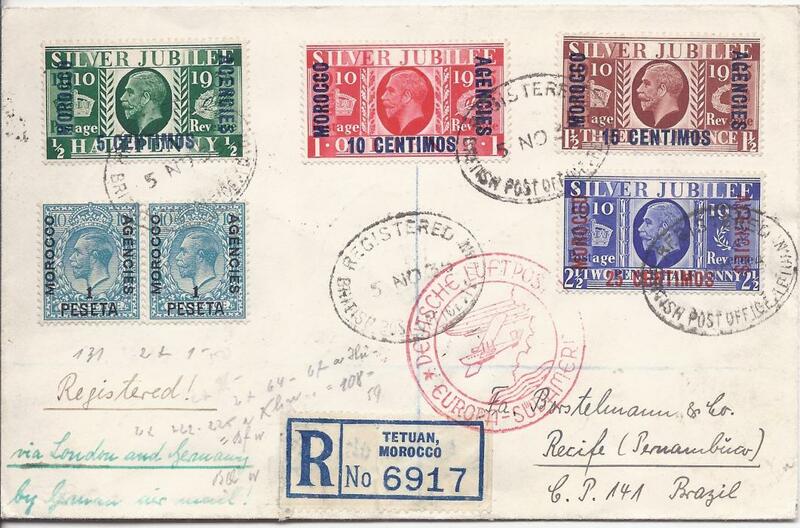 1935 (5 Nov) registered cover to Recife, Brazil, franked two Silver Jubilee sets and pair 1p. on 10d. tied oval Tetuan date stamps, red flight cachet at centre, arrival backstamp. 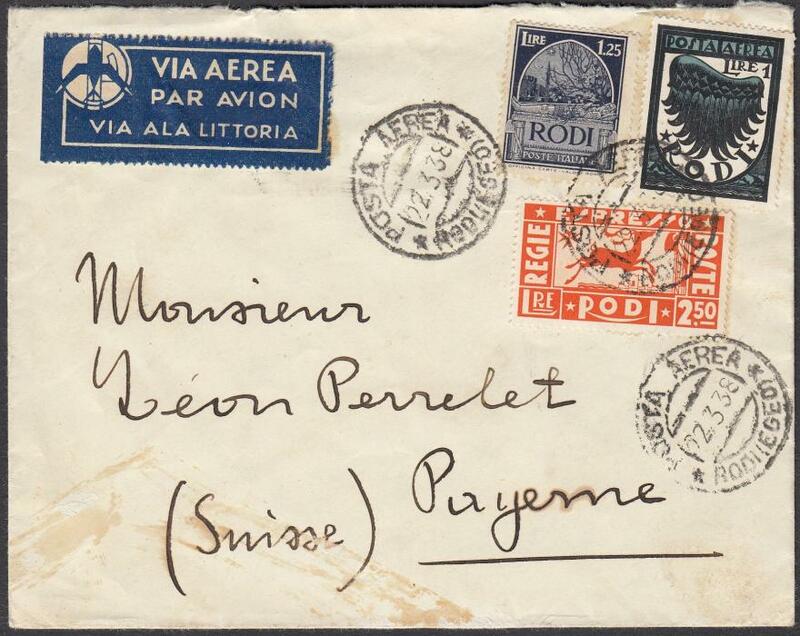 1938 air mail cover to PAYENNE, Switzerland franked postage 1L. and 1L.25 together with Express 2L.50 tied 'POSTA AEREA/RODI (EGEO)' cds; without backstamp and some staining at base. 1942 (28. 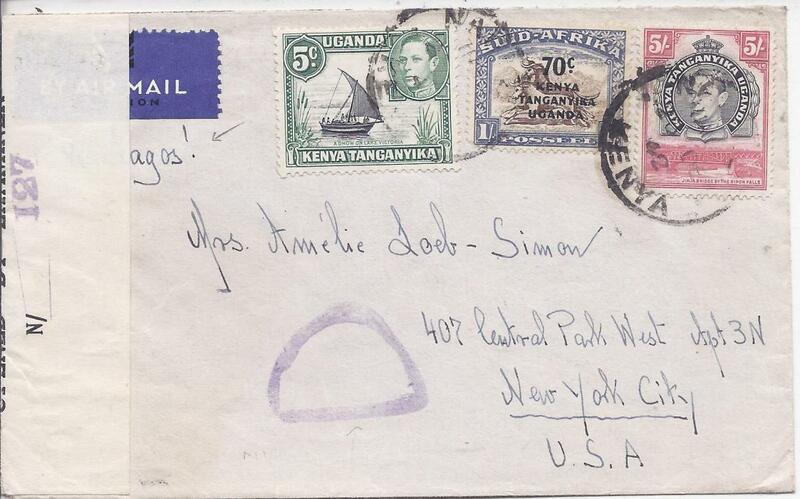 Dec.) censored airmail cover via Lagos to New York franked 5c., 70c. on 1/- and perf 14 5/- tied Nairobi cds. Nigerian censor handstamp and sealing tape. 1945 long registered cover to New York franked three 2d., two 2 1/2d., 3d., 2/6d. Parrot and 5s., arrival backstamp;generally good fresh condition. 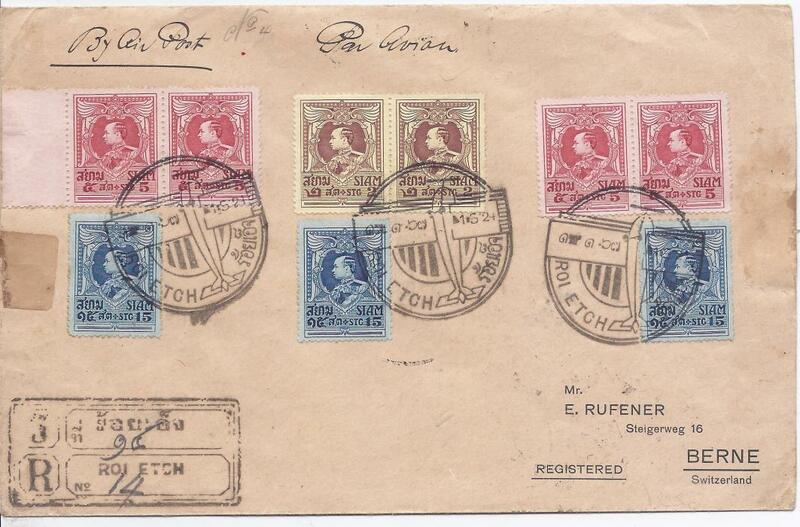 1946 (30 Jan) registered airmail cover via London to United States franked 6s30c double rate plus registration fee, the franking including perf 13 1/4 x 13 3/4, transit and arrival backstamps, slight faults to top of envelope. 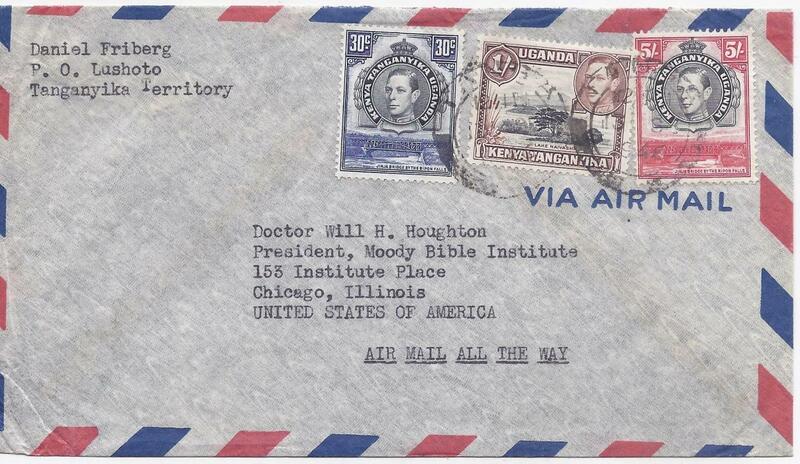 1946 (30 Jan.) airmail cover to United States franked 6s30c double rate, the franking including perf 13� x 13� 5s., without backstamps, fine condition. 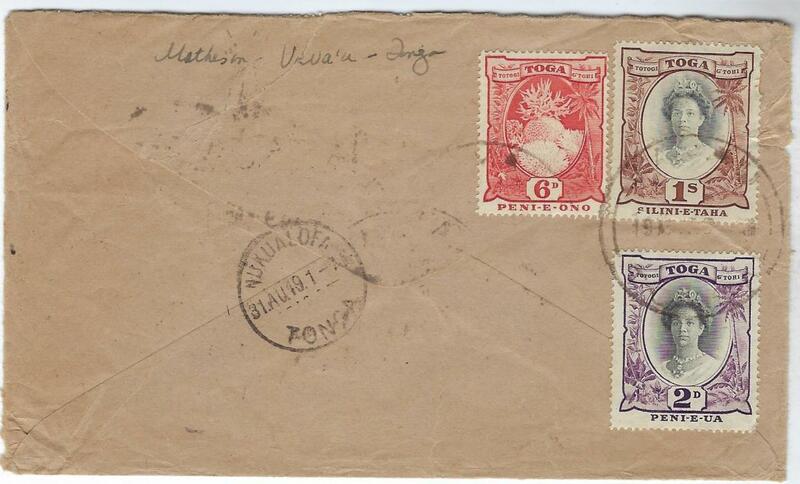 Ethiopia 1936 airmail cover to Vienna, the plane though caught fire and it crashed at Benghazi, Libya. The mail was partly recovered and a two-line cachet applied, 'Ricuperata Incendio/ drovolante I-RODI', Italian Office sealing tape applied at top, arrival backstamps. Stamps washed off and some slight faults as to be expected. 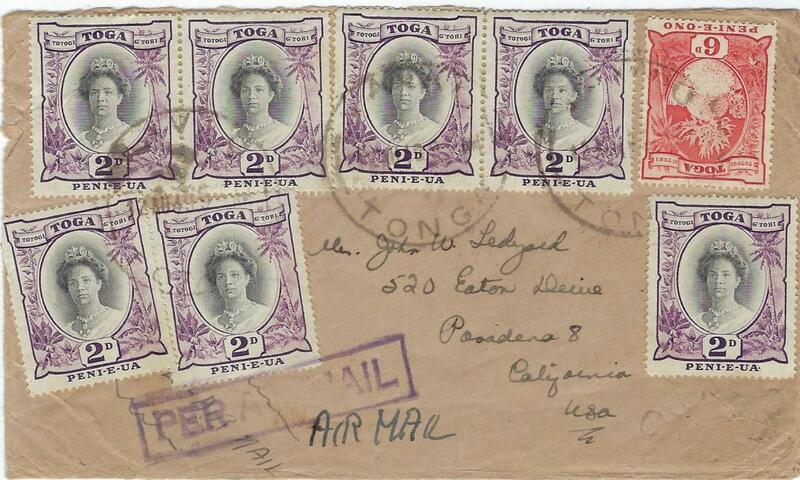 INDIA: (Airmail) 1911 internal cover endorsed �By Aerial Post� franked 2a. tied by fine illustrated FIRST AERIAL POST/ U.P. EXHIBITION ALLAHABAD, reverse with Allahabad cds and arrival cds; central vertical filing crease and slight tone bottom right of stamp.